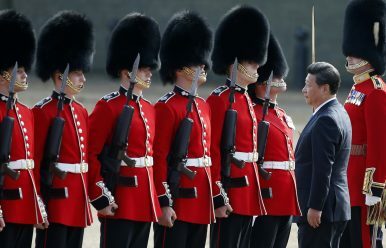 Chinese President Xi Jinping is escorted as he inspects a guard of honour during the official welcome ceremony at Horse Guards Parade in London, Oct. 20, 2015. Last week a British Parliamentary Report entitled “China and the Rules-Based International System” laid out in frank terms its view of the direction that China has taken under Xi Jinping, and the commensurate response with which Britain should reply. As the 30th anniversary of the massacre of students and civilians in and around Tiananmen Square in Beijing on June 4, 1989 approaches, the report’s recommendations to the British government are timely and relevant. The report urges the government to take major steps to develop a “comprehensive and strategic approach” toward China, and to craft and publish by the end of 2020 a “single, detailed public document” outlining the new framework. It is telling that Britain, even under extreme provocation by the Chinese over the decades, has continued to respond to China’s behavior by stressing ongoing engagement and mutual interests, rather than the reverse. The Opium Wars, the forced opening of treaty ports throughout China, the sacking of the Summer Palace, and China’s loss of Hong Kong to British sovereignty in the 19th century created a chronically contentious relationship between the United Kingdom and the People’s Republic for decades. Inheriting the problematic situation from its dynastic and republican political predecessors, the Communists’ approach exploded in 1967, at the height of the Cultural Revolution. On August 22 of that year, as the Cultural Revolution raged throughout China, the British Embassy in Beijing fell victim to its excesses. Set afire, the embassy burned down completely, but not before a mob of Red Guards had taken it over, beating, bludgeoning, and torturing the 23 diplomats, staff, and family members who were inside at the time. That apologist viewpoint continued to prevail in Britain for another 30 years, up to and well after the handover of Hong Kong to China, but not before its last British governor, Chris Patten, had spent months excoriating the Chinese government for its behavior and bad faith. Much of the British Foreign Office establishment continued to critique Patten, rather than the Chinese. Patten had called for democratic reforms in Hong Kong in advance of the colony’s 1997 handover back to China. But before the Hong Kong handover came the night of June 3-4, 1989. The British ambassador to China, Sir Alan Donald, watched events unfold from his vantage point on the roof of the ambassador’s residence in the Jianguomenwai diplomatic section of Beijing, close to Chang’an Avenue, which runs directly through Tiananmen Square. Sir Alan, a robust Scotsman, father of five, and hearty celebrant in his rebuilt embassy of Burns Night every January 25, died last July. Cambridge-educated and a Mandarin speaker, he was considered one of the Foreign Office’s pre-eminent diplomats on all matters Chinese. His secret cable describing the events that he and his staff witnessed, and more details he was told by a reliable source close to the Chinese government, was only de-classified in 2017. In that cable, Sir Alan relates that up to 10,000 people had died in Beijing as the tanks rolled through the city, indiscriminately shooting and bayoneting those in their path. Horrifically, according to the ambassador, bodies were collected, desecrated, and hosed into drains. Yet even this event did not spur any fundamental change in British Foreign Office policy toward China. The government, and Sir Alan himself, continued its negotiations with China over the fate of Hong Kong, an issue in which the British ambassador had played a key role in the early 1980s. Now, and one might say, finally, a significant segment of the elected representation of the British people are demanding that their government formulate an “overarching theme of a new policy towards China.” The report urges a detailed strategy to major issues, including: freedom of navigation in the South China Sea; the Belt and Road Initiative (BRI); the detention of Uyghur Muslims in Xinjiang; trade disputes; the subversion of rights in Hong Kong (“Hong Kong’s autonomy is at risk,” the report warns, “especially in the area of the rule of law”); and Chinese interference and influence in the internal affairs of the United Kingdom (cautioning against “the involvement of Chinese companies in any aspect of UK critical national infrastructure” and “interference… in academia”). As many nations around the world struggle to find a cohesive, principled response to China’s global adventures and tightening domestic controls, it is encouraging to see the British Parliament acknowledge the issues and call for a strategy to confront them. In Britain’s case, it could be said that the reply has been a long time coming.